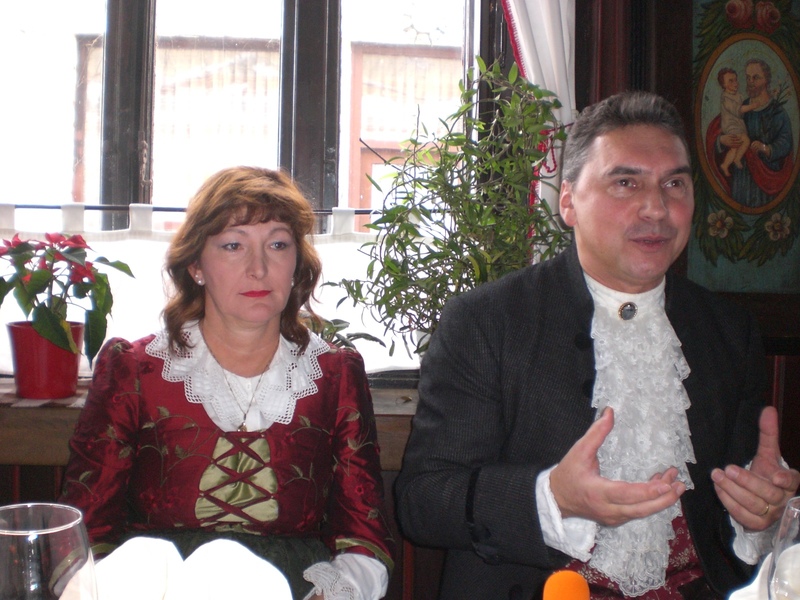 On Wednesday last week I was invited to a special lunch at Lectar Inn in Radovljica’s old town centre to mark the occasion of the 25th anniversary of its ownership in the hands of Jože and Lili. Theirs is a real rags-to-riches story. The couple told us a few stories about the past, including how when they first arrived in Radovljica to take over running Lectar Inn they initially had a lease to rent the restaurant for a 10-year period, however, it soon became apparent that it was to become their life’s work and that 10 years would be nowhere near enough so they enquired about the possibility of buying the property. At that time, they certainly didn’t have the financial means to do so as they additionally had to put a lot of money, time and effort into renovating the 500-year old house and also had 2 young children (which later became 4 children – including one set of twins). Lili recalled the day when 2 of the children came home from school in tears because they were the only ones amongst their classmates who didn’t have school slippers – they couldn’t afford them. Over time, all their hard graft began to pay off and nowadays, in addition to the family, they employ 17 staff across the restaurant, Lectar live gingerbread workshop and guest rooms. It is plain to see, that despite all the hard work they revel in what they do and have remained as hardworking and humble as ever, and more than deserve every accolade they have received. I must admit to having felt a lump in my throat listening to their stories of hardship and dedication to the business, the family, and each other. It also made me feel proud to be part of such and occasion and to live somewhere where such tradition is valued. Jože even went on to invite us all to the next big Lectar celebration – in 2022 – to mark 200 years of operation of the restaurant! The gingerbread museum has, however, been in operation even longer, since 1766. Unfortunately, I was unable to stay and enjoy the specially prepared lunch, though I did get a chance to sample some of the goodies on offer from some of the other Taste Radol’ce restaurants, among them the ever-delicious cake pops from Gostilna Kunstelj, sausages with tepka pears and chocolate-covered tepka pears from Vila Podvin, and the house dessert ‘Prešeren’s Cylinder’ from Chateau Lambergh. Although the main focus of Taste Radol’ca takes place annually during the month of November, all the participating restaurants also have Taste Radol’ca dishes as a permanent feature on their menus, denoted by little bee symbols, and made exclusively using local ingredients. 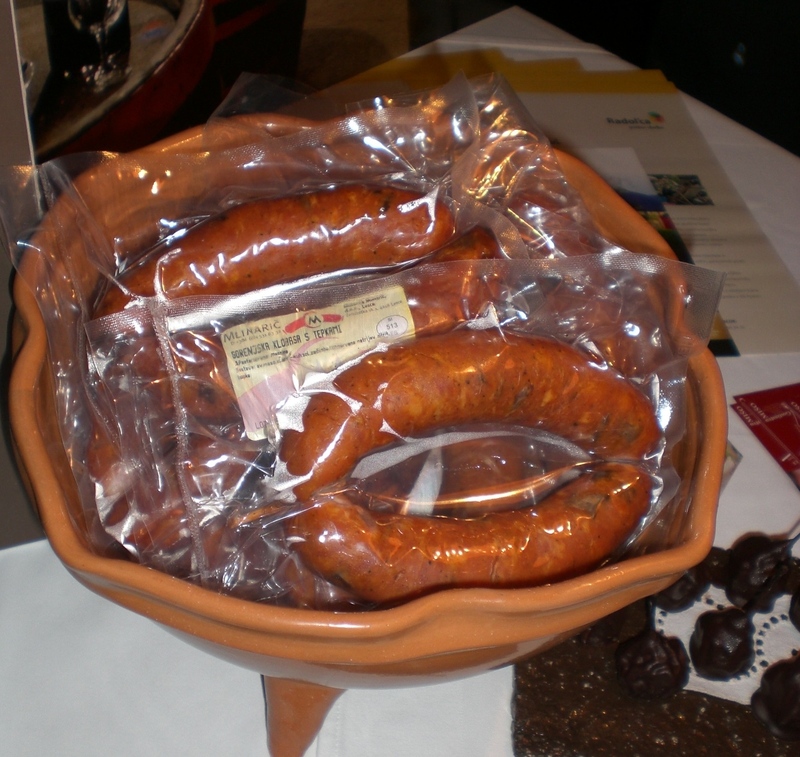 There’s plenty more about this in the Taste Radol’ca section of this blog. 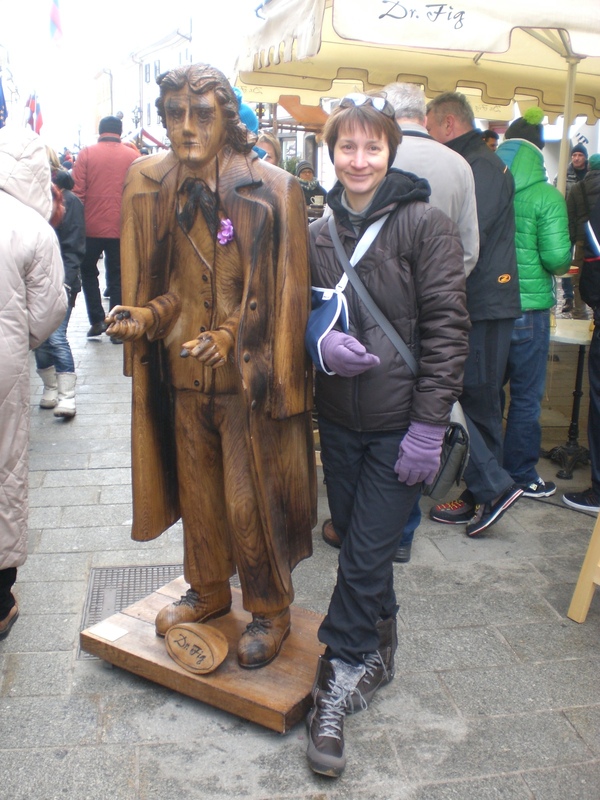 This Sunday was a cultural public holiday in Slovenia, Prešeren’s Day, to mark the date of the death, in 1849, of Slovenia’s great poet, France Prešeren. Unfortunately, as with last year, this year once again 8th of February fell on a weekend, meaning it was pretty much an ordinary day for most and the nation missed out on having a day off. I always find this a bit unfair as, unlike in the UK, if a holiday falls on a weekend here, as quite a few of them do in 2015, it’s just tough luck, and the following day in not given as a holiday in lieu. 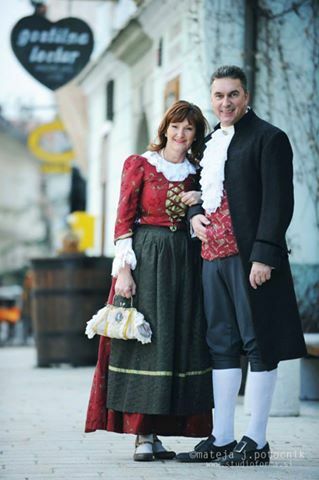 I always like to visit the Prešeren Fair (Prešernov smenj) in Kranj which is a celebration of all things ‘Prešeren. This year I had been looking forward to it even more as I’ve not been outside of Radovljica for some weeks now due to not being able to drive because of my broken shoulder (it’s been 4 weeks now since my fall and I’m going for an x-ray on Tuesday and really hoping for some good news – wish me luck!). 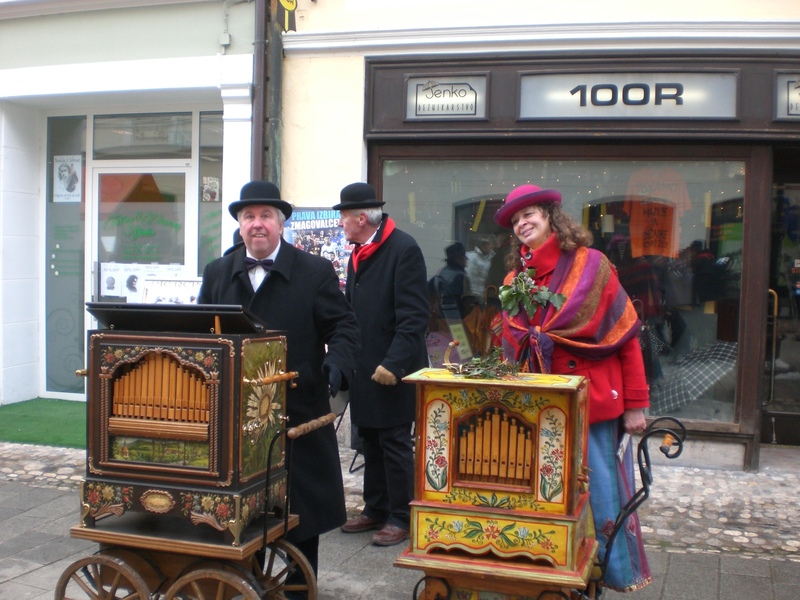 The fair includes music provided by organ-grinders, locals parading and dancing in traditional clothing, a market selling all manner of traditional, and some less traditional goods; homeware, clothing, etc. 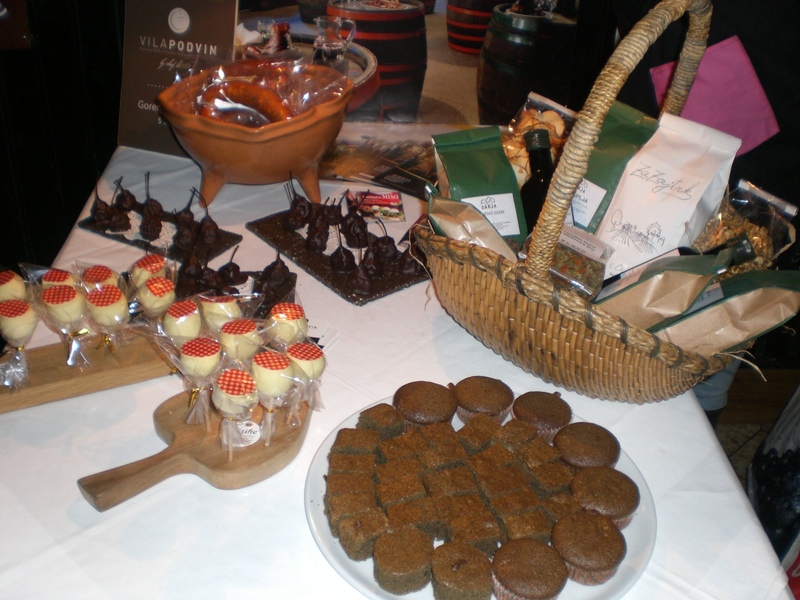 and plenty selling delicious cakes, biscuits, cheese, honey, dried meats etc. There are also demonstrations of traditional crafts, guided tours, exhibitions, workshops and more. Despite it being held in February, when it is often bitterly cold – as it was on Sunday – the day always draws a huge crowd and its nice to see the old town centre come to life and looking how it would have done in the early-19th century. This week I’ll be having a little celebration of my own as Wednesday marks my 8-year anniversary of moving to Slovenia! Gosh, where have those years gone! That’s the longest I’ve ever lived anywhere in my life, and its here where I intend to remain. a visit in the second week of June and they want t hike and climb Trigav but I worry although they have guides, etc. lined up. I worry about this part of their trip, but I guess this is what parents do best. My favorite eating experience was at Lector’ restaurant. I still can taste the delicious mushroom soup in a bread bowl and heir homemade ice cream. Also their hospitality. Please give my friends at Lector’s a big HELLO!!! for me. I agree with you that the Slovenian language is very difficult and it is true that the best way to learn it is by using it with the local folks. Hello Anita, thank you for your feedback. It’s great to hear you are enjoying reading my blog and that you love Slovenia too! Good to hear your daughter has a guide for Triglav as in June there will certainly still be snow so it’s very sensible to have a guide. And I agree about the delicious food! I will pass on your ‘HELLO’ to the team at Lectar!